How to open Windows automatically, i.e. without having to enter my PIN number every time I switch on the laptop. How to automatically login into Windows, without typing a password (using netplwiz) appears to be one way to do it. On windows 8 all I had to do is search netplwiz and open it & the option is there. I haven't circled where to uncheck the option but the above link shows you. If you're only ever using the laptop at home and there is no possible way anybody could gain access to it then it should be ok. To be on the safe side if you are taking your laptop with you away from home you should disable auto-login. My usual thanks for yr prompt reply. I am afraid, however, that netplwiz doesn't work with Windows 10. ... netplwiz doesn't work with Windows 10. Did you try the control userpasswords2 approach? I don't have Windows 10 at this stage. I'm still using Win 8. I just installed Windows 10 & a search & subsequent opening of control userpasswords2 shows the option. I tested with a restart and it works. You do need to put your password in twice in the last step however before the auto-sign-in will work. 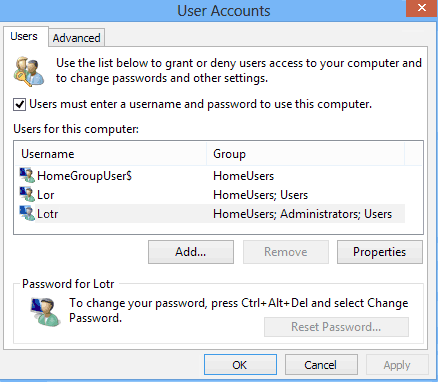 ie: Use File explorer & type/copy-paste in control userpasswords2 & the accounts panel will automatically open after you press Enter key on keyboard (or whatever it's called on Windows PC's.) Uncheck the option as shown then press Apply & OK buttons, then in the Auto-Sign-in panel that will open after this, choose the account on the computer you wish it to apply to & type in their password twice. In the last image example I whited-out the account User name.